Run and jump and jump and run! Note : Due to the high speed of the flickering, this is probably really bad if you suffer from Photosensitive Epilepsy. This week's game will be slightly more minimal than originally planned. I originally was going to add baddies and pickups and progression and all of that. But then I started playing it. After about 10 minutes without a single blink, I figured it'd probably be a bit TOO much to add anything more. At 10:30 this morning, this week's game was "good enough", and I've not touched it since. I do need to fix the scoring, and I'll probably throw in some online scores, but that'll be about it. Ooops, THAT's what I'm supposed to do on Thursdays! No matter, a day late, not to worry! Here's this week's suggestion box. 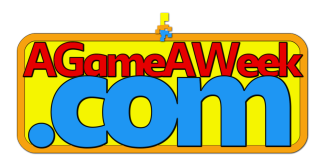 Fill the comments with your ideas/suggestions for future AGameAWeek stuffs. 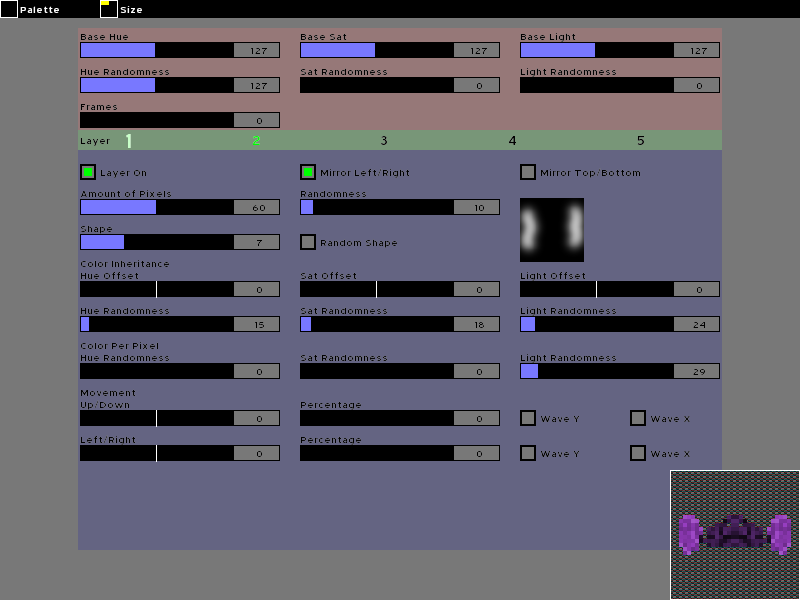 As I've already mentioned, the MiniRPG's on hold whilst I build the sprite maker doohickey. 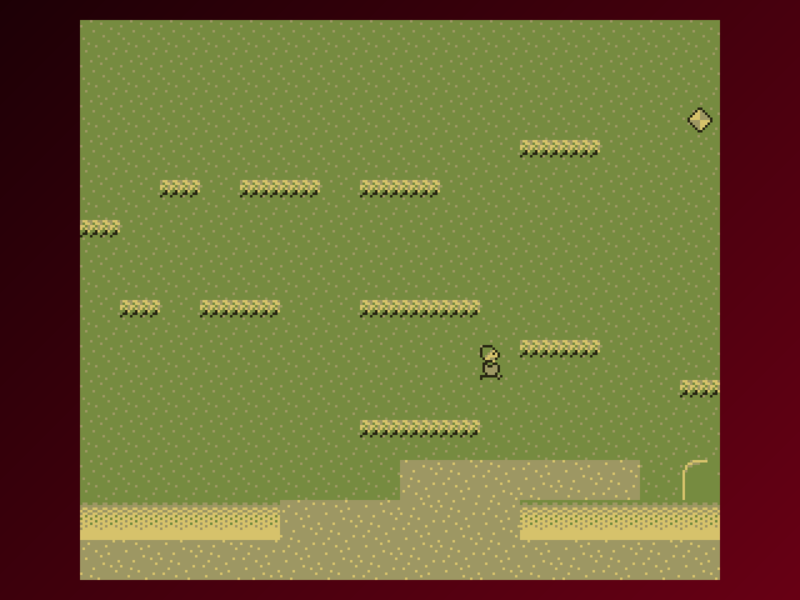 The doohickey's coming along nicely, and make quite a large leap today, but I'm still fiddling about trying to get it to feel "Just Right"
The thing is, although my old sprite maker seemed to come up with nice blobs, the new one appears to be much more random. Either they're preset shapes, or they're crazily splodged messes. I'm not really sure why that's happening, but I'm bashing ahead, and seeing if I can smooth things out a little. Should be here on Tuesday, although I'm not sure how good it'll end up being. Can't do both, too late to turn back! And yet I also didn't plan ahead far enough, and will be spending most of this morning removing a bunch of stuff, and redoing it all. Tuesday's little sprite buildey bobby will be all nice and super, and with any luck, should build some nice sprites and tiles and things like that. 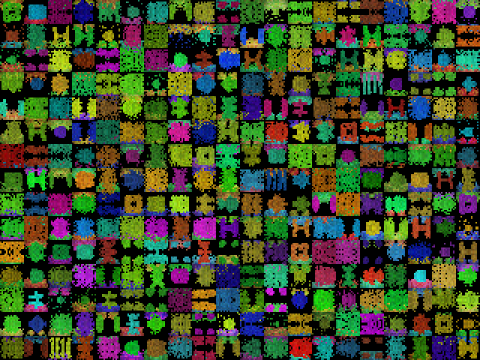 I'll pop in some nice presets for making tiles, floors, walls, baddies and whatever. Assuming I can get it all working in time! It's getting there, but I'll first need to redo most of those sliders/checkboxes, because having attempted to use them, I've realised I probably should've done them in a completely different way. Captain Hindsight will be shouting at me for this one. 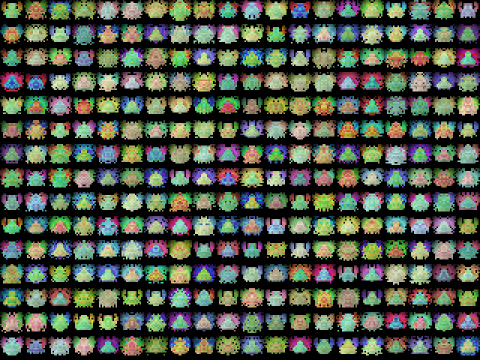 Currently the sprites have no shape forming, so the sprawling mass of purely random pixels on the bottom right looks pretty damn ugly. I'll be working on that today, along with the color sliders which aren't quite the way they're meant to be. .. Needs more base, and planning ahead! I did get the color palettes working, though, and it can render sprites in "Any colour/No Palette" or one of the included retro system's colour palettes! The sprite on this screenshot is rendered in ZX Spectrum colours. Adding a palette is as simple as making a 16x16 pixel image of color (which you can see loaded on the top left of the screen) and popping it into the palette folder. I haven't, though, accounted for quirky retro display rules, so all are pixel based, not block/otherwise based.. That probably doesn't mean a lot to some of the folk who visit here, though, so! Whatever!! It's time for our weekly "Post anything in your head" topic! Keeping with the classic retro theme, here's a nice and simple little 15-screen jumping platform game! Oops, forgot to post this, yesterday! No matter. After last week's retro styled "random" game, I decided to go for something similarly retro, but much less random. I've drawn some supercheap gameboy style sprites, and have been building a batch of quick and easy jumpy platform levels. I've done 11 levels so far, and am going to go the "Start from level 1, see how far you can get" route, so theres no checkpoints or anything. Just start, and hope you don't die..
9 lives seems adequate, so far, but I might up it if I build too much into the engine! 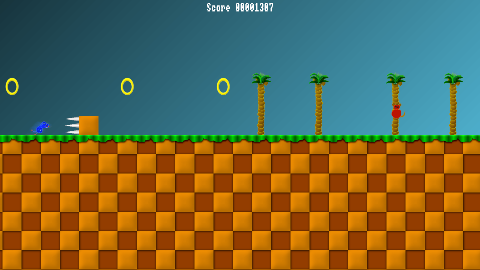 A nice and simple little jumping game! I've no idea what I'll be tackling this week, again, so pop a random thought or two below! A game cram packed into the space of only a day! I just sent off a nice lengthy reply to PixelProspector.com's Authentic Kaizen, all about plans for the future of the site, the possibility of me wrapping my head around Flash, thoughts about new new new new newer NeonPlat, and some kind of unpondered random top down maze thing. None of that's really important, just yet. It's all forward planning, and it all requires bits of learning all over the place. Less importantly, halfway through the email, I used the term "WiLMa" when describing the types of games I'm doing, and it suddenly occurred to me that I don't think I've ever actually mentioned WiLMa, before.. I started using it as a quickcode when compiling the Archive. Told you it wasn't important..
Have any thoughts? I'm a bit blank, this week. But then I was blank last week, too, and that didn't turn out TOO badly. It's still Tuesday in America! Stringy Things is out, for iPhone and iPod. Slightly annoying that this didn't happen earlier.. That would've let me do a great big "First AGAW of the year, Second iPod release" thing, earlier. And I'll be building it up as I go, so. .. If AGAW suddenly becomes a bit Wordgame biased.. .. um... that's purely co-incidental! Y3:W1 - Ted Bob's Pet Hammer! An ever so slightly shorter edition of this week's intended game, which almost didn't happen!! Nice and playable, although it's probably much more playable on Hard than on the other two levels! 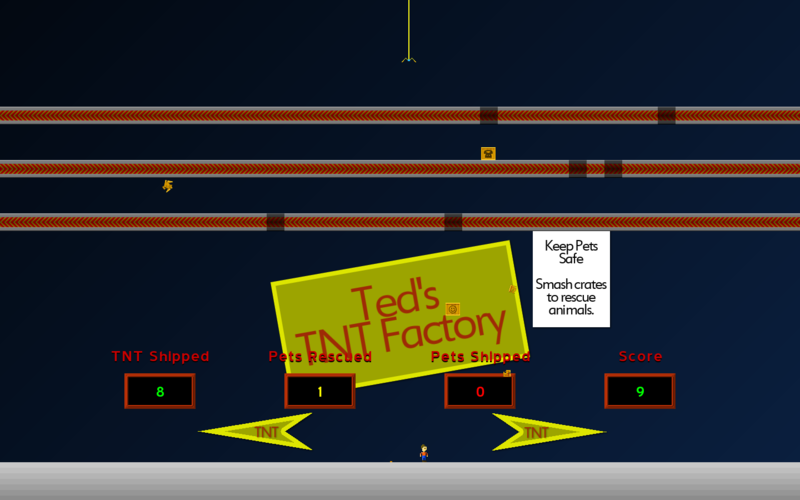 This week sees the return of silly-name favourite Ted Bob, as he grabs an Amy Rose style hammer, and attacks oncoming crates. This week's been super jolly. First, I couldn't settle back into the AGAW mood, then when I finally started a proper game, my Neck decided to completely screw up again, and I spent the next day and a half doing a kind of "1 line of code, 3 hours sleep" type thing. Which is probably just the right time for my PC to crap it's pants. The world seems to be throwing everything it's got at me, in an effort to stop me from starting AGameAWeek Year 3!!! I'm going to attempt to reboot the PC in a jiffy, and will do my best to backup all of today's work over to the other two systems. Hopefully I get enough time before it detonates, or it's a case of opening the thing up and manually plucking out the HardDrives... I'm really not in the mood for that, right now! Time remaining : 18 hours, 16 mins. Grab your hammer, and wait for the pets!